Read that again...God can do FAR BEYOND all that we could ask or imagine, we just have to allow God to work through us. Isn’t that amazing?!? God’s power coursing through us means we can do things we never would have imagined. So let God work through you as you go over your plans and goals for the month and see what you can accomplish together. Use this Ephesians 3:20 bible verse printable to inspire and encourage yourself in your home, office, dorm, or classroom. You can print it at home and hang it in a frame, with cute washi tape, or a fun thumbtack. Be creative! Ephesians 3:20 bile verse printable from Raye Allison Creations. 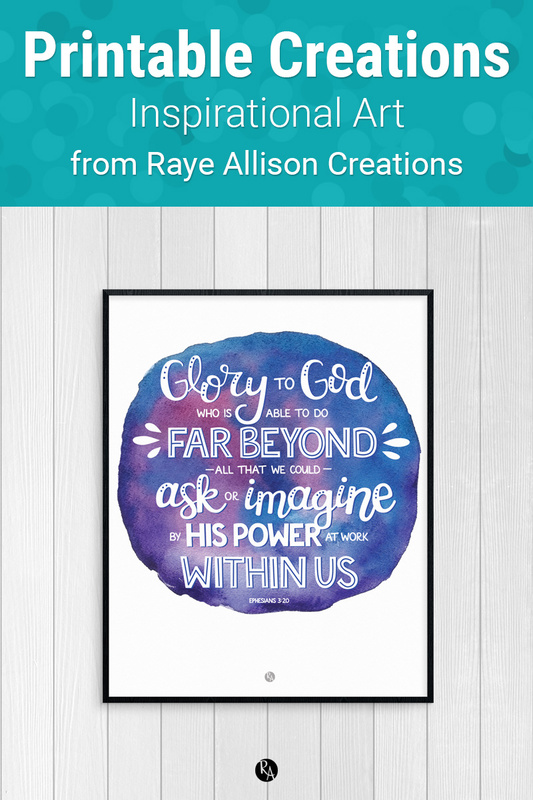 This week's printable bible verse is, "Glory to God, who is able to do far beyond all that we could ask or imagine by His power at work within us." Printables are great for home or office decor, classrooms, church bulletin boards, and so much more!